Despite decades of work, there are still gaping holes in the government’s anti-corruption policies. After marking International Anti-Corruption Day on December 9, it is important to reflect on what the Indonesian government’s fight against corruption has accomplished. We should ask three questions: Does Indonesia have adequate laws to fight corruption? Does the Corruption Eradication Commission (KPK) have the authority and resources it needs to do its job? Has the public recognized the importance of civic participation in promoting transparency and accountability within the government? The fight against corruption is more urgent than ever. Despite the government’s efforts, corruption is getting worse: in 2017, Indonesia slipped six spots, to a ranking of 96th out of 180, on Transparency International’s Corruption Perception Index. The Indonesia Corruption Watch (ICW) recently reported that, in the first half of 2018, there were 139 corruption cases, many involving political parties, politicians, and various levels of government officials. 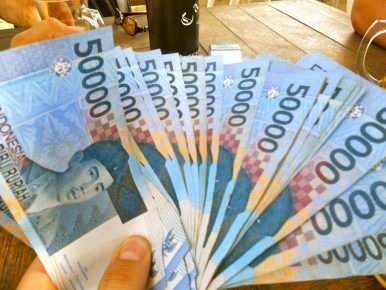 The ICW further estimated that, during this period, the government lost 1.09 trillion Indonesian rupiahs ($75 million) to corruption and that 42.1 billion rupiahs in bribes were paid. Corruption in Indonesia’s public service has become a real concern for foreign investors. It is now commonplace for companies to have to pay bribes to expedite public services or to protect their business interests. This has slowed the growth in foreign investment, which is critical for Indonesia’s continued development. The Indonesian government has been committed to combating corruption for a long time. Nearly 20 years ago, the People’s Representative Council (DPR) enacted the Eradication of Acts of Corruption Law (UU Tipikor). Indonesia also ratified the United Nations Convention Against Corruption (UNCAC). However, in practice, law enforcement institutions still have not effectively implemented anti-corruption laws. Meanwhile, in order to achieve a future free from corruption, Indonesia needs to have stronger legislation and more vigorous law-enforcement authority. Until today, Indonesia has not fully adopted the UNAC provisions into its national legislation. This makes it harder to handle complex cases — especially those involving corruption in the private sector, trading in influence, illicit enrichment, bribery of foreign public/international organization officials, and asset recovery. On November 27 of this year, the KPK, in collaboration with the United Nations Office on Drugs and Crimes (UNODC), hosted a public review regarding the status of previous recommendations to implement UNCAC. The forum concluded that, in order to comply fully with the UNCAC, Indonesia still needs to implement 24 recommendations out of a total of 32. This year, Indonesia is currently focusing on three of the recommendations. The KPK strongly urged the ratification of the UNCAC through government action in lieu of law (perpu). The process for legislators to ratify the provisions of UNCAC is lengthy, so it is crucial to use this expedited process – especially given the upcoming national elections. As corruption is endemic at all levels of society, it is important to strengthen and to expand the authority of the anti-corruption commission. The chief of the KPK, Agus Raharjo, has recommended that the KPK be legally recognized as a permanent government institution, with adequate resources and clearly defined powers. Agus also has emphasized the importance of revising UU Tipikor to regulate corruption in the private sector. While public corruption is a major concern, approximately 80 percent of corruption cases in Indonesia involve the private sector, according to Minister for National Development Planning Bambang Brodjonegoro. Corruption has been called an extraordinary crime. This is not surprising considering its complex structure and the unique tools needed to eradicate it. In order to achieve its goal of eradicating corruption, the Indonesian government must expedite revision of the Indonesian Eradication of Acts of Corruption Law by incorporating the complete provisions of the UNCAC. The government also must strengthen the KPK by making it a permanent institution. By fighting corruption in the private and business sectors, the government will be able to build the trust of foreign investors and promote additional foreign investment. In addition, mitigating the risk of corruption in the political sector will strengthen Indonesian democracy. The Indonesian people should consider corruption as an important factor in this upcoming election year. Indonesians should elect leaders in 2019 who offer the best anti-corruption agenda and who are dedicated to fight corruption. Ahmad Novindri Aji Sukma studied International Business and Economic Law (IBEL) at Georgetown University Law Center under LPDP scholarship. The views expressed are his own. The commission has won international praise, but faces challenges at home.